“Back in the day” are words that preface many of Lee Smith’s reflections on a baseball life that began in rural Louisiana, was influenced by American Legion coaches and led to an 18-year career in the big leagues where he was one of the most feared relief pitchers in the game’s history. “Back in the day,” he explains, he had to finish all his chores before his father would let him go play baseball, which he saw as a welcome break from farm work. It was a time – and still is – when his hometown had no stoplight. Kids like Smith and his teammates came from little farm towns throughout a 100-mile area and assembled in Natchitoches, La., to play American Legion ball on summer afternoons. And following each game, players would pile into a pickup, front and back, and gather at the Cotton Patch diner to meet with family and friends to eat and talk about the game. His American Legion team, he explained, was like family. He said it was a time when they didn’t worry so much about pitch count, defensive shifts or at what point the relief pitcher entered the game, regardless if a save opportunity was on the line, he said. Smith remembers discipline, sportsmanship and knowledge of the game among the most important values American Legion Baseball instilled in him. He remains friends with his Legion coach, 87-year-old James Morgan, who plans to join several of Smith’s former American Legion Baseball teammates from back in the day for his July induction into the Hall of Fame. American Legion National Commander Brett P. Reistad attended opening ceremonies of the weekend celebration, which featured an illustrated panel on the history of American Legion Baseball, a Legion information table staffed by New York Legionnaires and a new 8-minute film on the history of the baseball program, produced as part of the organization’s centennial celebration. Hundreds of American Legion Family members poured into the hall over the weekend for discounted tours, remarks from speakers, a panel discussion and an autograph signing session with Smith. Feller famously said that he may have been the first American Legion player enshrined in the Hall of Fame but he would not be the last. The 2019 inductees include former Legion players Smith, Roy Halladay, Mike Mussina and Harold Baines. “It’s been really amazing, seeing where I came from, from a town that doesn’t have a red light – from a hay field – to playing American Legion Baseball, to the Hall of Fame,” said Smith, who today operates a farm in the same area where he grew up when he isn’t working as a minor league pitching coach in the San Francisco Giants system. Smith had 30 or more saves in 11 different seasons and averaged one strikeout per inning of his professional career. He pitched for the Chicago Cubs, Boston Red Sox, St. Louis Cardinals, New York Yankees, Baltimore Orioles, Anaheim Angels, Cincinnati Reds and Montreal Expos. His 478 saves were the most in baseball from 1993 to the 2006 season and still rank third on the all-time list behind Mariano Rivera’s 652 and Trevor Hoffman's 601. A seven-time All-Star, Smith led his league in saves four times. 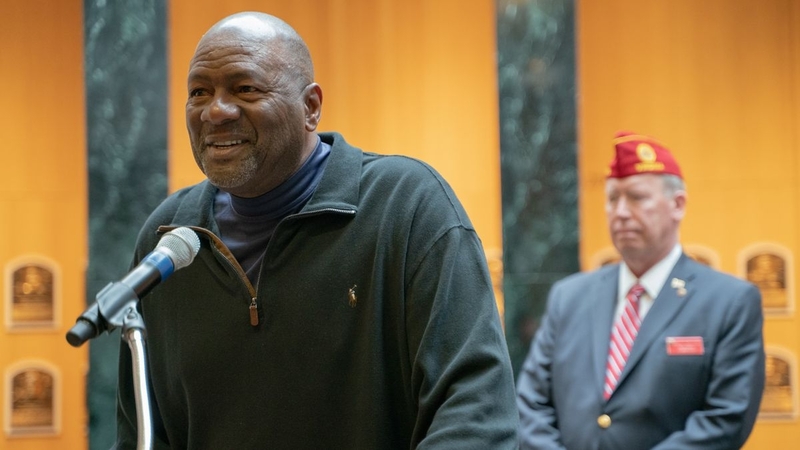 “Just as The American Legion is a part of the fabric of American society, American Legion Baseball is woven into the fabric of our national pastime,” said Jon Shestakofsky, vice president of communications and education at the Hall of Fame. “Every year, the Hall of Fame welcomes through its doors thousands of active military members and veterans at discounted and complimentary admission rates. We also welcome countless current and former ballplayers who benefited from the opportunity to play American Legion Baseball. The event was coordinated by The American Legion Department of New York, led by Commander Gary Schacher and Department Baseball Committee Chairman Bruce Mayfield.